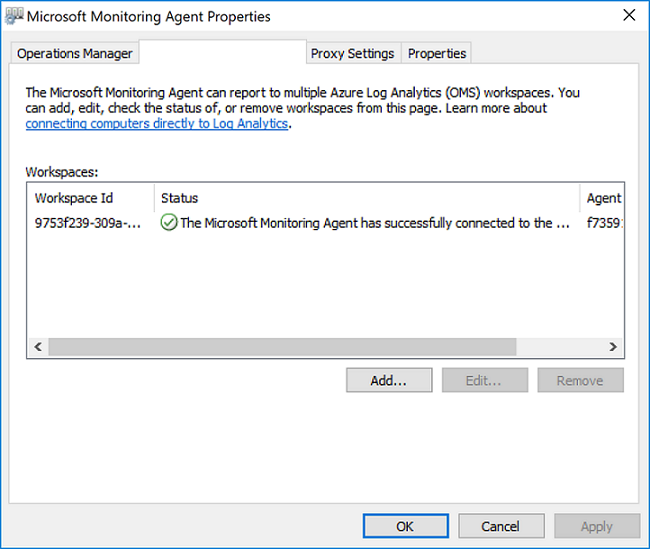 In order to monitor and manage virtual machines or physical computers in your local datacenter or other cloud environment with Azure Monitor, you need to deploy the Log Analytics agent (also referred to as the Microsoft Monitoring Agent (MMA)) and configure it to report to one or more Log Analytics workspaces. The agent also supports the Hybrid Runbook Worker role for Azure Automation. On a monitored Windows computer, the agent is listed as the Microsoft Monitoring Agent service. The Microsoft Monitoring Agent service collects events from log files and Windows event log, performance data, and other telemetry. Even when the agent is unable to communicate with Azure Monitor it reports to, the agent continues to run and queues the collected data on the disk of the monitored computer. When the connection is restored, the Microsoft Monitoring Agent service sends collected data to the service. The agent may be installed by using one of the following methods. Most installations use a combination of these methods to install different sets of computers, as appropriate. Details on using each method are provided later in the article. Manual installation. Setup is manually run on the computer using the setup wizard, from the command line, or deployed using an existing software distribution tool. Azure Automation Desired State Configuration (DSC). Using DSC in Azure Automation with a script for Windows computers already deployed in your environment. Resource Manager template for virtual machines running Windows on-premises in Azure Stack. Azure Security Center (ASC) depends on the Microsoft Monitoring Agent (also referred to as the Log Analytics Windows agent) and will install and configure it to report to a Log Analytics workspace as part of its deployment. ASC includes an automatic provisioning option which enables automatic installation of the Log Analytics Windows agent on all VMs in your subscription and configures it to report to a specific workspace. For more information about this option, see Enable automatic provisioning of Log Analytics agent. To understand the supported configuration, review supported Windows operating systems and network firewall configuration. Before installing the Log Analytics agent for Windows, you need the workspace ID and key for your Log Analytics workspace. This information is required during setup from each installation method to properly configure the agent and ensure it can successfully communicate with Azure Monitor in Azure commercial and US Government cloud. In the Azure portal, click All services. In the list of resources, type Log Analytics. As you begin typing, the list filters based on your input. Select Log Analytics. In your list of Log Analytics workspaces, select the workspace you intend on configuring the agent to report to. Select Connected Sources, and then select Windows Servers. Copy and paste into your favorite editor, the Workspace ID and Primary Key. To configure use of the TLS 1.2 protocol for communication between the Windows agent and the Log Analytics service, you can follow the steps below to enable before the agent is installed on the virtual machine or afterwards. Create a Client subkey under the TLS 1.2 protocol version subkey you created earlier. For example, HKLM\System\System\CurrentControlSet\Control\SecurityProviders\SCHANNEL\Protocols\TLS 1.2\Client. Configure .NET Framework 4.6 or later to support secure cryptography, as by default it is disabled. The strong cryptography uses more secure network protocols like TLS 1.2, and blocks protocols that are not secure. 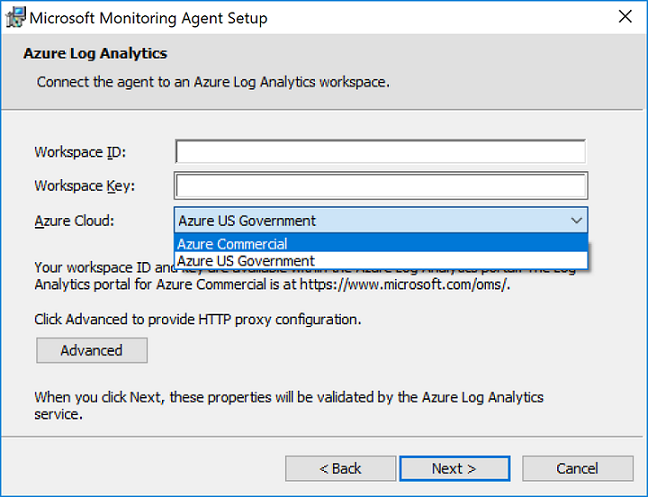 The following steps install and configure the Log Analytics agent in Azure and Azure Government cloud by using the setup wizard for the agent on your computer. If you want to learn how to configure the agent to also report to a System Center Operations Manager management group, see deploy the Operations Manager agent with the Agent Setup Wizard. In your Log Analytics workspace, from the Windows Servers page you navigated to earlier, select the appropriate Download Windows Agent version to download depending on the processor architecture of the Windows operating system. Run Setup to install the agent on your computer. On the License Terms page, read the license and then click I Agree. On the Destination Folder page, change or keep the default installation folder and then click Next. 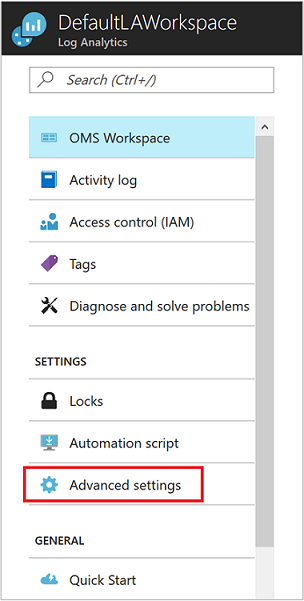 On the Agent Setup Options page, choose to connect the agent to Azure Log Analytics and then click Next. Paste the Workspace ID and Workspace Key (Primary Key) that you copied earlier. If the computer should report to a Log Analytics workspace in Azure Government cloud, select Azure US Government from the Azure Cloud drop-down list. If the computer needs to communicate through a proxy server to the Log Analytics service, click Advanced and provide the URL and port number of the proxy server. If your proxy server requires authentication, type the username and password to authenticate with the proxy server and then click Next. Click Next once you have completed providing the necessary configuration settings. On the Ready to Install page, review your choices and then click Install. When complete, the Microsoft Monitoring Agent appears in Control Panel. To confirm it is reporting to Log Analytics, review Verify agent connectivity to Log Analytics. The downloaded file for the agent is a self-contained installation package. The setup program for the agent and supporting files are contained in the package and need to be extracted in order to properly install using the command line shown in the following examples. If you want to upgrade an agent, you need to use the Log Analytics scripting API. See the topic Managing and maintaining the Log Analytics agent for Windows and Linux for further information. The following table highlights the specific parameters supported by setup for the agent, including when deployed using Automation DSC. To extract the agent installation files, from an elevated command prompt run MMASetup-<platform>.exe /c and it will prompt you for the path to extract files to. Alternatively, you can specify the path by passing the arguments MMASetup-<platform>.exe /c /t:<Full Path>. You can use the following script example to install the agent using Azure Automation DSC. If you do not have an Automation account, see Get started with Azure Automation to understand requirements and steps for creating an Automation account required before using Automation DSC. If you are not familiar with Automation DSC, review Getting started with Automation DSC. This procedure and script example does not support upgrading the agent already deployed to a Windows computer. The 32-bit and 64-bit versions of the agent package have different product codes and new versions released also have a unique value. The product code is a GUID that is the principal identification of an application or product and is represented by the Windows Installer ProductCode property. The ProductId value in the MMAgent.ps1 script has to match the product code from the 32-bit or 64-bit agent installer package. To retrieve the product code from the agent install package directly, you can use Orca.exe from the Windows SDK Components for Windows Installer Developers that is a component of the Windows Software Development Kit or using PowerShell following an example script written by a Microsoft Valuable Professional (MVP). For either approach, you first need to extract the MOMagent.msi file from the MMASetup installation package. This is shown earlier in the first step under the section Install the agent using the command line. Import the xPSDesiredStateConfiguration DSC Module from https://www.powershellgallery.com/packages/xPSDesiredStateConfiguration into Azure Automation. Create Azure Automation variable assets for OPSINSIGHTS_WS_ID and OPSINSIGHTS_WS_KEY. Set OPSINSIGHTS_WS_ID to your Log Analytics workspace ID and set OPSINSIGHTS_WS_KEY to the primary key of your workspace. Copy the script and save it as MMAgent.ps1. $OPSINSIGHTS_WS_ID = Get-AutomationVariable -Name "OPSINSIGHTS_WS_ID"
$OPSINSIGHTS_WS_KEY = Get-AutomationVariable -Name "OPSINSIGHTS_WS_KEY"
Update the ProductId value in the script with the product code extracted from the latest version of the agent install package using the methods recommended earlier. Import the MMAgent.ps1 configuration script into your Automation account. Assign a Windows computer or node to the configuration. Within 15 minutes, the node checks its configuration and the agent is pushed to the node. Once installation of the agent is complete, verifying it is successfully connected and reporting can be accomplished in two ways. From the computer in Control Panel, find the item Microsoft Monitoring Agent. Select it and on the Azure Log Analytics tab, the agent should display a message stating: The Microsoft Monitoring Agent has successfully connected to the Microsoft Operations Management Suite service. You can also perform a simple log query in the Azure portal. In the Azure portal, click All services. In the list of resources, type Azure Monitor. As you begin typing, the list filters based on your input. Select Azure Monitor. Select Logs in the menu. | where Category == "Direct Agent"
In the search results returned, you should see heartbeat records for the computer indicating it is connected and reporting to the service. Review Managing and maintaining the Log Analytics agent for Windows and Linux to learn about how to manage the agent during its deployment lifecycle on your machines.